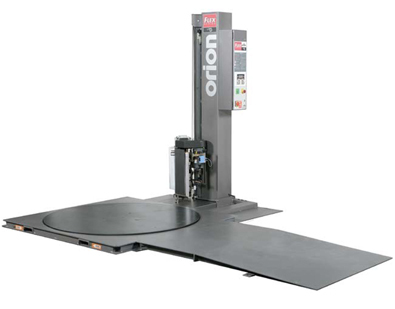 Orion's series of semi-automatic stretch wrapping machines are generally portable and usually require an operator to attach the film, run the cycle, and then detach the film. These systems have possible throughput rates of up to 30 loads per hour. The Flex LPS holds the same standards of durability, reliability, and performance as the rest of the Flex line, yet at an affordable price. 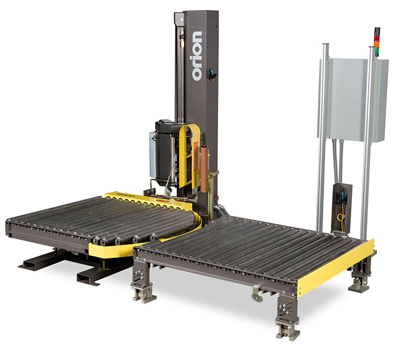 This system is well suited for loading by either forklift or pallet jack with available ramp option. 63" Round Turntable for Loads up to 55" by 55"
Similar to the LPS, the Flex HPS holds the same standards of durability, reliability, and performance as the rest of the Flex line, yet at an affordable price. 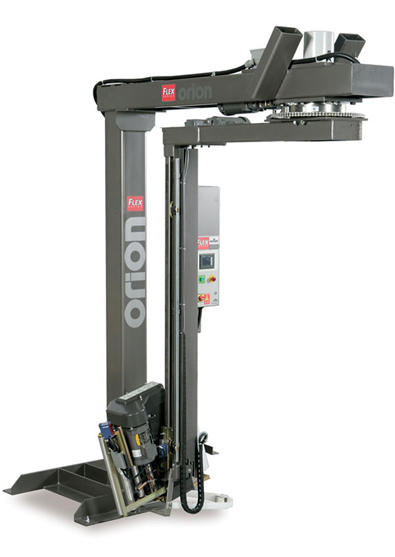 This system is ideal for applications where it is primarily loaded by forklift. 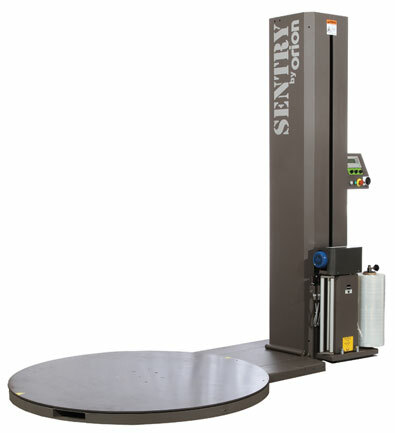 48" by 48" Octagonal Turntable for Loads up to 55" by 55"
The Sentry is an entry level, turntable style wrapping machine designed for economical and efficient unitization of pallet loads with stretch film. It can dramatically increase efficiency and lower film cost per load compared to hand stretch wrapping. Wraps pallet loads (52" by 52" by 80" max.) weighing up to 4,000 lbs. 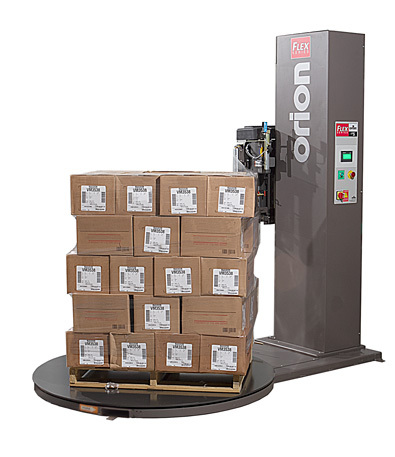 The Flex CTS is designed to increase fork lift efficiency and reduce load handling times by providing a powered conveyor turntable and a gravity conveyor used as a staging platform for wrapped loads waiting to be picked up. It dramatically reduces to amount of time handling loads, while offering throughput speeds approaching fully automatic systems at a fraction of the cost. 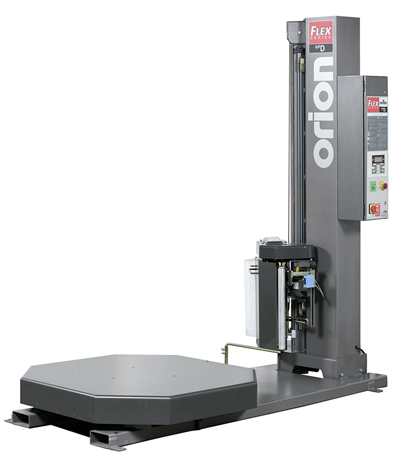 The Flex CTS eliminates the need for operator to attach and cut film and eliminates time loss from forklift drivers watching loads being wrapped. The Flex RTD represents the latest in rotary tower stretch packaging technology. 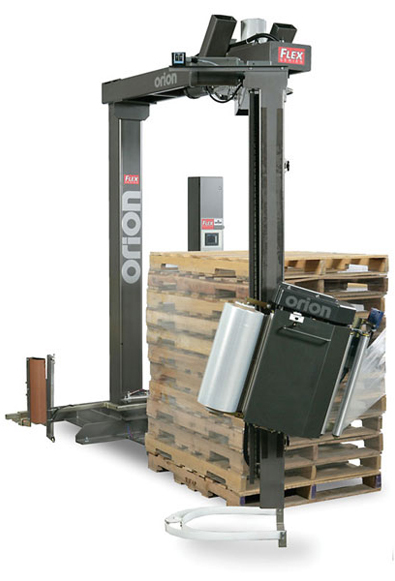 It can be loaded by pallet jack or lift truck. The Flex RTD is ideal for unitizing even the most difficult loads, including those that are extremely heavy, light, fragile, or unstable. The Flex RTA is the fastest way to boost end of line packaging efficiency. The operator need only place the load and pull the switch, the system performs all wrapping functions. The High Profile Deluxe is built with economy, efficiency, and safe operation in mind. It is easy to install with a dual turntable option for existing machines. This is a low cost alternative to purchasing a second machine. 48" by 48" Turntable for Loads up to 55" by 55"
Similar to the HPD, the Low Profile Deluxe is built with economy, efficiency, and safe operation in mind. This system features a full surround deck to protect the turntable and to insure products are kept safe and secure. 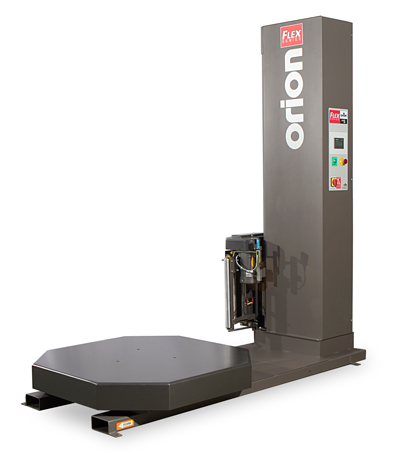 63" Diameter Turntable for Loads up to 55" by 55"
Have some questions about the Orion Stretch Wrapping Systems? Take a look at some Frequently Asked Questions!